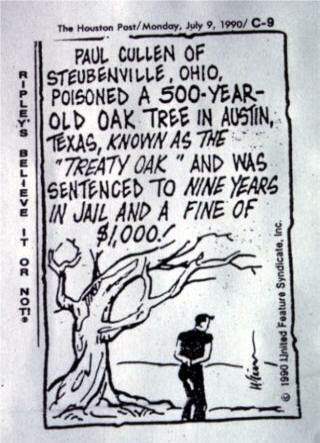 The Treaty Oak is a living symbol of history. Since its poisoning early this year, the heroic efforts to save it have proved to be the challenge of my career. This is an intriguing story of an historic tree, its malicious vandalism, how the art and science of forestry and arboriculture were applied to try to save it, and how this great tree’s sacrifice can be a message for each and every one of us. Our Chamber of Commerce estimates the Treaty Oak to be over 600 years old. Most foresters settle on about 300, but once you have seen the majesty of this tree, it’s not hard to believe the Chamber of Commerce. 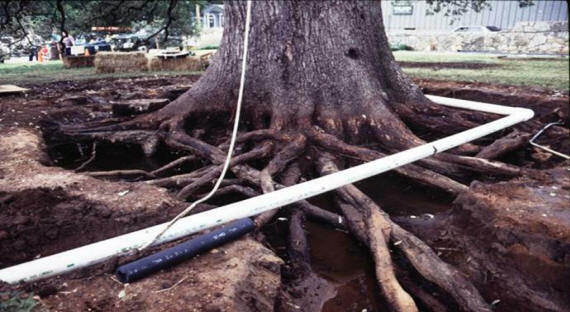 In fact, the live oaks (Quercus virginiana) that grow in the chalky, dry limestone soils around Austin have a peculiar habit of root sprouting, that is, throwing up genetically identical clones from the roots; given this, it is possible that its current four-foot diameter, 50-foot height, and 90-foot spread may only be the latest sprout off of a common root system dating back thousands of years. Whatever its age records show that it has had important historical associations with the residents of Texas. Historians tell us that the Treaty Oak is the last of a grove of fourteen trees known as the Council Oaks. The original Texans regarded it as a Tree-God, a temple of worship for the Comanches and Tonkawa Indians. In the shade of the oaks’ wide-spreading branches, the natives would meet to dance the war dances, smoke the peace pipe, and celebrate feasts and religious ceremonies. Myths and magic surrounded the tree. Indian maidens believed that a sauce made from its acorns, if taken by warriors on the eve of battle, would bring their loved ones safely back. 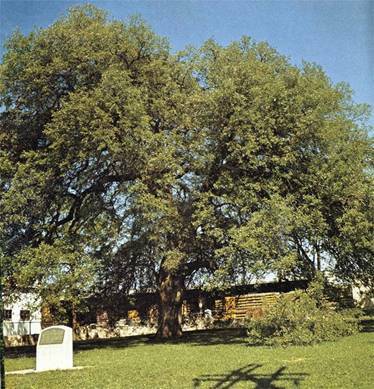 The Treaty Oak has also played an important and romantic part in the history of the Lone Star State. One legend has the Father of Texas, Stephen F. Austin, signing the first boundary treaty with the local Indians under the tree, and hence its name. While there is little proof of this, the grove was an accepted boundary between Whites and Reds. In fact, in 1841, the first county judge of Austin went past the grove in search of stray cattle and was killed by Indians. As the capitol of Texas developed into a burgeoning city, the members of the Council Oaks fell one by one, and by the 1920s, the Treaty Oak itself was threatened. A cry went up throughout Texas to save the oak, because, as Mrs. W.C. Stoner wrote in the Texas Garden Federation News at the time, “No massive building, no marble shaft erected by man could ever compare to the beauty and grandeur of this natural, living monument planted by our Maker himself, and no hand should cause it to be brought low except the hand of Him who gave it. 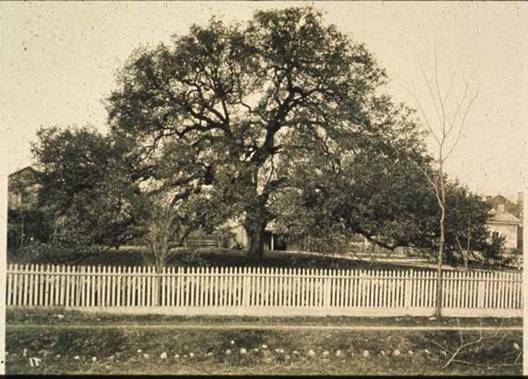 This mighty oak should be a tree of peace to all Texans and the tender sacred sentiments it arouses should inspire all posterity.” In 1922, it was added to the American Forestry Association’s compilation of famous and historic U.S. trees. Such was public sentiment that on August 11, 1937; the Treaty Oak was purchased from Mr. T. J. Caldwell, a banker, rancher, and state senator. In an area hard hit by the Depression, the one-quarter acre lot was purchased by the city of Austin with donated and public funds. 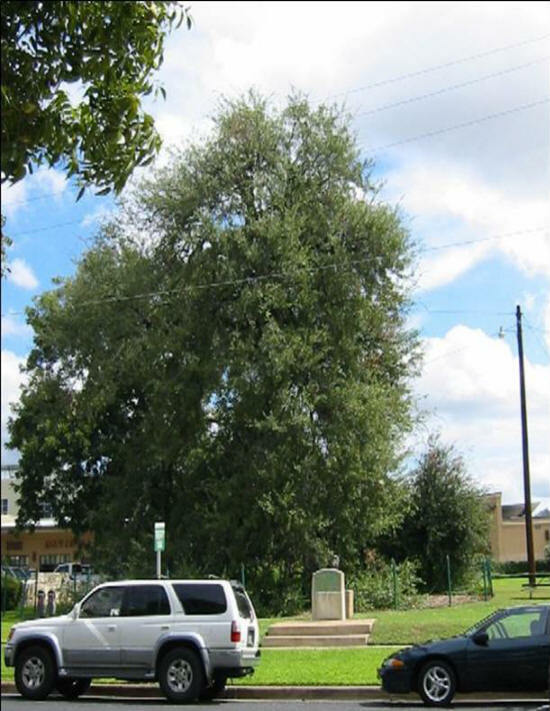 The lot was sold with the stipulation that the city could not destroy the tree or use the land for any other purpose so long as the tree remained alive. In recent years, as the city has grown up around it, the tree has been the site of picnics, weddings and other important personal events including this forester’s proposal of marriage. On March 2, Texas Independence Day, the Treaty Oak was the last stop on a local tree conference tour. As the bus emptied and the group gathered under the tree, we noticed that there was a band of about three to four feet of dead grass around the base of the tree. In addition, there was what looked like a circle or arch going out from the base of the tree on the East Side. We supposed that it was caused by a city employee’s careless applica­tion of a chemical grass edger during routine maintenance. However, no further thought was given to it since these chemicals rarely damage trees. It was not until the first of June when a woman who works nearby the tree called the city forester’s office after noticing some brown leaves. 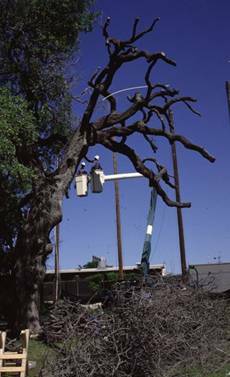 The first report was that the tree was showing signs of oak wilt, a fungal relative of the Dutch elm disease that has destroyed more than 10,000 oaks in Austin over the past two decades. When we investigated, however, we found leaf symptoms more typical of chemical injury than disease. We moved quickly and asked our State Department of Agriculture and Texas A&M University for assistance. Soil samples were taken and within several days we had excavated six to eight inches deep and injected both activated charcoal to bind the chemical, and active microbes to digest it. We then waited to see what would happen. A few days later the analysis came back from the laboratory. We were startled to learn that Velpar, an herbicide made by the DuPont Corporation in LaPorte, Texas, had been used. 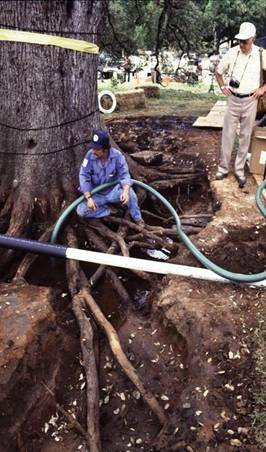 We had assumed that a chemical had been applied accidentally, but if it was Velpar (hexazinone), it was no accident, and we were faced with the first recorded intentional poisoning of an historic tree. Velpar is used commercially by the pulp and paper industry to clear land of undesirable species, including oaks, when they grow among pines being raised for pulp. Pines arc tolerant of Velpar whereas most other species are not. It is used locally in our Central Texas area by ranchers to control mesquite and other brush on rangeland. The discovery that Velpar had been used could only mean that someone had tried to kill the Treaty Oak. But who and why? An investigation was started by the Austin Police Department. Soon after, DuPont responded to the misapplication of their product by offering a $10,000 reward. The Texas Forestry Association upped this by another $1,000. By the end of June, Paul Stedman Cullen, a 46-year-old unemployed feedstore worker, had been arrested. Reports say that an informer told police that both he and Cullen had driven around Austin looking for a tree to poison. News reports also say that it was done to rob the spirit of the tree as part of a ritual to protect a woman from another man. He has been charged with criminal mischief by causing damage of more than $20,000 and a second-degree felony punish­able by two to 20 years in prison and a fine up to $10,000. However, his previous record of twice being imprisoned for burglary could enhance the crime to a first-degree felony. If the jury agrees and he is convicted, the maximum punishment could be life in prison. Today, he remains in custody unable to raise a $20,000 bond. The label for Velpar suggests that for best control the chemical should be spot sprayed at the base of the tree. For the Treaty Oak, a lethal dose would have been about five ounces. We assume that some portion or all of a one-gallon container was used. This would be roughly 25 times the amount needed to kill the tree. We also estimate that the poisoning occurred sometime in early February or before. If that is true, then the tree had remained in highly contaminated soil for some four or five months before symptoms were noticed on the leaves. Moisture is required to activate Velpar in the soil. It is drawn into the plant with water and transported to the leaves, where it is concentrated as water evaporates. It acts by blocking a key step in photosynthesis thereby preventing the tree from manufacturing food. As the leaf becomes more and more contaminated, it turns brown and is shed by the tree. The tree responds by pushing out new leaves that, in turn, are also contaminated by the poison and are lost. This cycle continues until the tree has used up all of its energy reserves and cannot produce more leaves. This is when the tree dies. Live oaks in Austin can put on more than one set or flush of leaves each year. In fact, after the annual shedding of leaves this past spring, many live oaks put on two flushes. When we first noticed the leaf symptoms in early June, less than 40 percent of the first flush was damaged and the second flush was still healthy. Several weeks later, however, much of the first flush had browned and fallen, and the second set was starting to show symptoms. We knew then that our initial excavation and injection treatment had not been successful. When we saw the second set of leaves becoming symptomatic, we decided to expand the treatments and call in additional experts to help us. It was then, just like in an old-time western movie; the Calvary came over the hill to save the day. In our case, it was Mr. H. Ross Perot, a Texas industrialist and billionaire who let us know that whatever it cost, however long it took, he would support our efforts to save this icon of Texas history. After several days of phone calls, we brought together the Treaty Oak Task Force, a group of 22 Ph.D.’s and practitioners from around the country. For one day, they reviewed what was known about Velpar, what treatments had been done to date, and discussed possible treatment alternatives. When they were gone, we were left to implement their recommendations. The experts all basically agreed on three points. First, lower the stress on the tree so that the tree could fight the effects of the chemical without dealing with the heat of summer. Second, collect more data to find out how much poison was in the soil and how much was in the tree. Third, remove the contamination from the soil and the tree. One-two-three save the tree. There was only one small detail. While tens of millions of dollars had been spent to bring Velpar to market for its intended use of controlling trees, no one had ever tried to save a tree that had been treated. We were in uncharted territory without a guide. Reducing stress, our first treatment goal, was easy to talk about but difficult to do. How do you create an open-air intensive-care unit to keep a 50-foot patient cool in a climate where there are more than 100 days a year over 900F? The answer was water and shade. 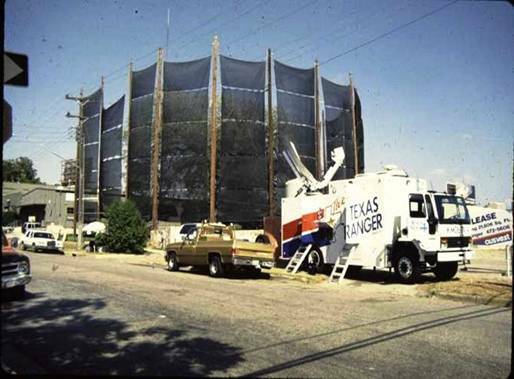 First, we installed an “irrigation system in the sky.” From large tanks placed in a parking lot next to the park we pumped Texas spring water that had been donated and delivered free. The water was pumped through a three-inch line by an electric pump to the tree, where it split up into smaller lines that crisscrossed the tree’s three main branches ending in sprinkler heads above the crown. During July and August, we pumped nearly 1,500 gallons a day. We used an automatic timer to pump every half-hour for 60 to 90 seconds during the heat of the day. The goal was to cool the crown and not wet the ground. We also installed a series of screens around the east, south, and west sides of the tree to lower heat stress. The city-owned Electric Utility Department bored 12; 10-foot deep holes every 20 feet and dropped in 70-foot wooden poles. They cabled the tips together and added three lightning rods. Along the side of each pole, they ran a steel cable from eight feet off the ground to 55 feet in the air. To this were attached the screen panels made of plastic-coated nylon screening, similar to what is used on tennis court fences. Aircraft cable was sewn into the edges of the panels for strength. The entire panel was joined to the cable on the pole and to the panel above and below by clips resembling rock-climbing carabiners that could be closed and locked shut. Each screen was made up of five panels connected together. To the top of each screen a rope was attached so that the screens could be raised and lowered through a pulley at the top of the pole. When the screens were up and the sprinklers were on, it could be ten to fifteen degrees cooler under the tree. Other measures taken to reduce stress included fertilization and aeration. We have fertilized both by spraying the foliage and injecting the soil. A dilute solution of one-tenth strength Rapid- Gro fertilizer was used several times to try to replace nutrients lost as a result of successive leaf falls. We also aerated to reduce compaction under the tree and promote better air exchange in the soil. Since the entire park is filled with roots, we marked out a grid of painted dots on a three-by-three-foot spacing and augured a three-inch diameter hole, 24 inches deep at each dot. We removed the original soil and added a light textured back-fill mix of sand, peat bark and soil microbes. A golf course aerator was also used several times to help lessen the impact of the workers’ heels as the treatments were being done. Our second goal was to find out how much poison was in the soil and how much was in the tree. Immediately after the Task Force meeting, we used a soil auger to sample to four foot deep at various locations around the tree. The results from the laboratory showed that there was Velpar at lethal concentrations down to three feet. With this information, we completely removed the soil around the base of the tree. The samples of root, trunk, twig, and leaf tissues, taken over a four-month period, have shown only a small drop in Velpar concentration within the tree. This high level of poison, despite the removal of contaminated soil and the shedding of contaminated leaves, has not been encouraging. To date, over $25,000 of the $100,000 spent to save the tree has been spent to process soil and tissue samples. Removing the contamination, our third treatment goal, has called for some novel approaches because it was generally felt that flooding to remove the contamination would activate the Velpar and worsen the situation. 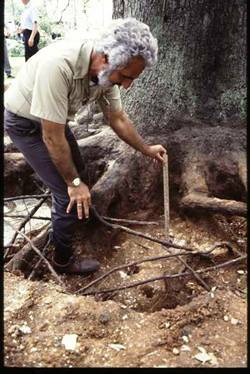 We began by re-excavating our initial treatment area and hand-digging to a depth of two feet and eight to 15 feet out from the trunk. Two feet down, we started to hit a mat of smaller roots that made digging time-consuming and difficult to do without serious damage to the roots. To solve this, we called in a pumper-truck crew from the Austin Fire Department. They connected to a fire hydrant and laid out several high volume, low pressure lines for our workers to sluice away the last foot of soil. We then sucked up the mud slurry into a vacuum truck ordinarily used by our Public Works Department to clean out storm sewers. The slurry was then pumped into a tanker truck, treated with activated charcoal, and disposed of at a city waste-water treatment plant. At 36 inches, the fertile dark soil around the tree gave way to a sandy bottom, a probable reason why very little of the water soluble Velpar was found at deeper levels. By the middle of July, the third set of leaves was damaged and the fourth set was ready to break bud to replace them. There was a general consensus among the Task Force that the levels of Velpar were still toxic and it was time to neutralize or flush the poison from the tree. Given the chemical nature of Velpar, a very strong acid or a very strong base would have been needed to change its chemical makeup and neutralize it; either one of these would have killed the tree. The other approach, to flush the poison, seemed to hold more promise. The idea was to push the weakly charged Velpar out of the xylem cell walls, and into the fourth set of leaves, by displacing it with another ion--in this case, potassium from a dilute solution of potassium chloride salt. About 35 gallons were injected into the root flare. Several three-gallon garden sprayers filled with the solution were pumped to 20 pounds of pressure and connected to a harness of tubes and T-shaped injectors adapted from Elm Research Institute equipment. The oak took less than three hours to take up the solution. While leaf samples taken immediately before and after the injection showed that a significant amount of Velpar was pushed to the leaves, subsequent tissue samples still showed very high levels within the tree. Our attempt to flush out the poison had been only partially successful. About one month later, in the beginning of September, most of the fourth set of leaves were brown and falling, and the fifth set was beginning to push out. Members of the Task Force, who were familiar with the effects of Velpar on oaks, had told us early on that oaks generally go through five or six sets of leaves until running out of energy. We knew that there was still toxin inside the tree and that its energy reserves were running low. We reasoned that if we could replace some energy while the tree still had leaves, the tree would be better able to overcome the poison by either neutralizing it by some unknown enzymatic action over the winter or by physically shedding the poison with each successive set of leaves. We decided to inject “tree food” into the tree. We were now into a new fourth phase of treatment and one that had very little support from research. After checking with tree physiologists from around the country, we determined that a dilute solution of sucrose injected into the tree would probably not damage it. However, very few researchers thought that it would be of much benefit either. Using the salt injection technique, but slightly higher up on the trunk, we injected about eight pounds of sugar in 65 gallons of distilled water; a fungicide was also added to check any microbial growth. In all, it took about 32 hours to complete the infusion. The benefits, if any, of this injection, will probably never be known. The current outlook for the Treaty Oak is guarded. When we analyzed wood samples taken from the drill bit used for the sugar injection, we found that there were still extremely high levels of Velpar in the tree. Today we remain cautiously optimistic. As the tree goes dormant this winter, we will be waiting until this spring’s new leaves to see if the Treaty Oak will survive. Could the Treaty Oak die? A tree that has survived centuries of scaring summers, dusty drought, and whistling ‘winds seems immortal to us--a symbol of strength and permanence in an age of increasing vulnerability and change. When it became clear that our efforts to help the tree rid itself of the poison were not as successful as we had wished, we started to hope for the best but plan for the worst. In the past month, we have taken over 500 twig cuttings and 50 root cuttings. Our goal now is not only to save the existing tree in the park, but to preserve the Treaty Oak by replication. If it is possible to grow a new Treaty Oak from a cutting, it may also be possible to tissue culture, or clone, this tree. There is the potential to create hundreds of thousands of Treaty Oaks. In fact, corporate sponsors have already lined up to fund this effort, and commercial nurseries are being contacted to see if they are interested in a license to grow and market Treaty Oaks. It may be that, in the not-too-distant future, you will be able to go to your local nursery and purchase a Treaty Oak for planting in your front yard. It is comforting to believe that this majestic tree will survive. With all of its worldwide fame, the Treaty Oak has truly become a symbol of our time. Its poisoning begs us to consider not only the reality of its desperate plight but also the larger truths it represents. Just as many cultures have held the tree to be a symbol of knowledge and life, we today are being asked to believe in the tree once again; to believe that billions of new trees will give us Global ReLeaf. But tree planting is also a symbol of a larger truth. While there are many symbolic and practical reasons for tree planting, perhaps the best is that it reminds us that we are part of the world. It reminds us that each of us must change our own prodigal behavior to stop the poisoning and begin to repair the damage to the thin skin of life covering the planet we call home. In conclusion, I would like to extend thanks, to all those who have given support to our efforts to save the tree: to Mr. Perot for his financial support, our mayor, Lee Cooke, and council, and especially council member George Humphrey for his leadership with our Austin ReLeaf efforts; to the dedicated scientists both corporate, government, and private who unselfishly gave us both their time and expertise, especially Dr. Arthur Costonis of Systemics Incorporated, Dr. David Appel of Texas A&M University, Dr. Jerry Brand of the University of Texas, and Dr. Thomas Perry of the University of North Carolina; to the dozens of city workers who patiently met every demand put on them; and lastly, to the tens of thousands of well wishers from around the globe. I have been moved by their outpouring of love, sympathy, and compassion.